So that'll be all until the Europa League games later, on which we'll have live text commentary. Thanks for joining us again and we hope you'll come back later to see if Arsenal and Chelsea can make it six English teams in this season's European quarter-finals. Arsenal will then seek to overturn a 3-1 deficit from their first leg against Rennes. Alexandre Lacazette is back from suspension for the Gunners while Henrikh Mkhitaryan will have a late fitness test. Chelsea winger Callum Hudson-Odoi received his first call-up for England's Under-21s and could feature in Ukraine later as the Blues aim to clinch their place in the Europa League's last eight. However, manager Maurizio Sarri has said that Dynamo Kiev's Olympic Stadium pitch is "a disaster" and could cause injuries. Demarai Gray, James Maddison. Harvey Barnes and Hamza Choudhury were all named in England's Under-21 squad earlier. Leicester manager Brendan Rodgers said: "It’s James' first season in the Premier League and he’s made great strides. I saw him a few years ago at Aberdeen. He’s got a lot of potential and he’s willing to work at his game. "Hamza's a very good young player. He’s not played for me as of yet but I’ve really enjoyed working with him. He’s a young player with a lot of potential." Brendan Rodgers and Sean Dyche have already pitted their wits against each other in the Premier League, and Rodgers returns to Turf Moor for his third game in charge of Leicester. The ex-Liverpool boss said: "Sean has done an outstanding job at Burnley. Last year, they had really good success and they qualified for European football. "What’s shown with Sean is the quality of his management. He’s got them winning again." Manager Sean Dyche also confirmed that Burnley have no fresh injuries as he prepares to welcome Brendan Rodgers' Leicester to Turf Moor. Back to the Premier League now, where Burnley went nine unbeaten before losing their last three. The Clarets go into Saturday's game two points above the bottom three. Manager Sean Dyche said: “I’m not that fussed about others. You can spend a lot of energy worrying about that, but we just have to focus on ourselves. 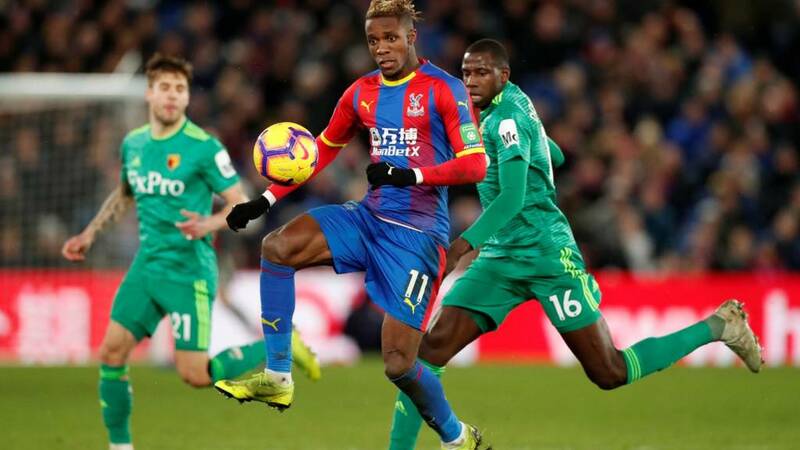 Palace boss Roy Hodgson says he won't be resting anyone for the all-Premier League tie at Watford, who have beaten the Eagles 2-1 both home and away in the league this season. Hodgson said: "Any changes we make will be in order to win the game, not to give players a rest. We want to give ourselves the best chance. The teams we've put out in the FA Cupfalse have been strong. "We've played Watford twice already and we've seen them as much as you can any team in the Premier League. They've played well and deserve to be where they are this season. "Both games have been tight with Watford this season. Both teams will go in realising they've got a good chance of winning, but both will know that it will be decided by fine margins." Chelsea winger Callum Hudson-Odoi was named in the England Under-21 squad for the first time earlier. Palace defender Aaron Wan-Bissaka was picked again for games against Poland and Germany this month, despite being linked with a call-up to Gareth Southgate's senior squad. Palace boss Roy Hodgson said: "It's a very big honour for Aaron in itself. Reading Gareth's comments, he is clearly aware of what Aaron can do. He's got an awful lot of football, and time, to play for England." Palace boss Roy Hodgson has confirmed that goalkeeper Wayne Hennessey is fit again, along with defender Pape Souare. He said: "Pape joined back in training on Monday and has trained all week. It's good news: his shoulder’s okay. "Bakary Sako hasn’t trained for the last few days but he's not far from being fit. He picked up a minor calf problem and of course Mamadou [Sakho] is the other one. "He's working very hard to recover but he only had the operation just over a week ago. It'll be a while until we see him back in rehabilitation. But he is adamant that he doesn't want to write off the season. He will do his level best but we’ll have to see." Watford will aim to avenge that defeat in Saturday's quarter-final at Vicarage Road and earn another trip to Wembley. Real Madrid have agreed to sign defender Eder Militao from Porto at the end of the season for his buy-out clause of 50m euros (£42.7m). Huddersfield now have eight games left and are 16 points from safety as they visit West Ham. “I am not here as a magician," added boss Jan Siewert. "At the moment it’s still about the games we have left. “I think it’s important to know you cannot just win games with fight but we do have to fight. Huddersfield captain Jonathan Hogg may not be fit enough to return until April. Town manager Jan Siewert said: “Jonathan could be out for two or three more weeks. He had a big impact on his ribs. Terence Kongolo could train tomorrow but we will see. Adama Diakhaby, Isaac Mbenza, Terence Kongolo, Jonathan Hogg, Demeaco Duhaney and Danny Williams could all be out for Huddersfield. Manager Jan Siewert said: “Unfortunately there’s many injuries at the moment. “We had 15 healthy players on the training pitch today. We will have a look at the squad in training tomorrow before we choose our team." Huddersfield have lost six of Jan Siewert's seven games in charge so time is running out for Town to climb out of the bottom three. “When I came in, it was all about performing," said Siewert. “We know that West Ham will be a difficult game but we know the task in front of us. West Ham were beaten by relegation-threatened Cardiff last time out and manager Manuel Pellegrini wants to avoid a repeat against Huddersfield, who are 16 points from safety at the bottom. He said: "I think we always need to win the game. It doesn't matter who we play, Huddersfield is the same. "Maybe they're a more dangerous team. They are not playing for nothing. If we want to win then we need to play at our best." "Carlos Sanchez, Andriy Yarmolenko and Jack Wilshere will continue with their recovery," he said. "Andy Carroll has a problem with his ankle. The rest of the squad is okay. With Andy, we need to wait for some medical examination."